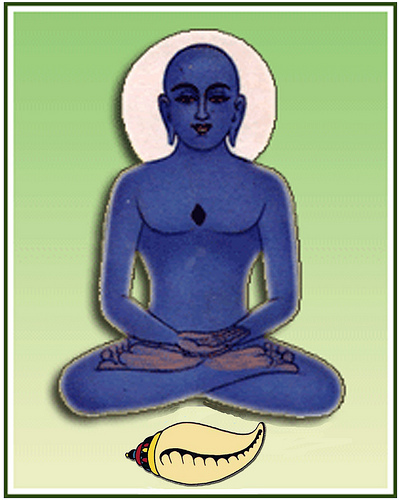 Bhagwan Neminath ,the 22nd Tirthankar, was a cousin, of Krishna. Andhakavrisni, the king of Sauripur had ten sons, of which the eldest was Samudra Vijay and the youngest was Vasudev. Samudra Vijay became the father of Neminath, as Vasudev became the father of Krishna. The name of Neminath's mother was Shivadevi. The entire race, the Yadavas, had fled Sauripur because of the fear of Jarasandh, who was a half-Chakravarti Emperor and Prati-Narayan and they had taken shelter in Dvaraka. Krishna is one of the 63 illustrious personages, he was a Narayan and his brother Baldev was a Balabhadra. This was the Age of the Mahabharata, when flourished the Pandavs and the Kauravs, who have been noticed in the Jain Puranas. Rajmati (Rajul), the princess at the famous city of Junagadh near the Girnar mountain was betrothed to Nemi Kumar. From both the sides, elaborate preparations were made for the celebration. It was at its pitch and the marriage procession reached the vicinity of Junagadh. The inmates at the palace at Junagadh were anxiously awaiting the arrival of the procession. Things were ready for the performance of rites at the entrance. The atmosphere everywhere was one of joy. Although Rajul, who was surrounded by her attendants who were cracking jokes befitting the occasion, looked grave, inside, she was also in a light mood, awaiting the arrival of the procession. While dreaming of the pleasant company of Nemi Kumar, she had in fact forgotten everything else. Right then, like a cyclone, the news spread all over the city that being sympathetic to the mute appeal of the animals who had been caged for the purpose of the marriage dinner, the minutest chord of attachment in Nemi Kumar had given way. He had decided not to marry, removed the nuptial thread, and taken the road to the Girnar mountain. His attachment had transformed into detachment, and having torn asunder the great acquisition including the parents, treasures, granaries, the kingdom and every other object of attachment, and like wise all internal attachments, like greed, malice, etc., he had become a digamber-possessionless monk. The news took no time to spread. Efforts were made to induce him to return, but all was in vain. The Lokantik "gods" appeared and approved his decision. The initiation was appropriately celebrated with suitable zeal by all "gods" and men. There dropped a curtain of metamorphosis on the whole situation which changed from a happy marriage occasion into an environment of detachment. Rajul's mind too changed. She too took the road to self-realisation. Following the footprints left by him, she proceeded towards the Girnar mountain. The whole city looked agape with a sense of deprivation. The members of the marriage party had come to acquire a bride, but they lost the groom. King Ugrasen desired to endow a huge dowry on his daughter and send her to her new home in a palanquin, but all these remained discarded, and Rajmati proceeded towards the mountain in a white saree. The king had collected and got prepared costly robes to be bestowed on his son-in-law, but he discarded whatever robes he had on his person and became a digamber-possessionless monk and took his place on the mountain. He had come to marry with Rajul but events turned in a manner in which he got married with liberation. The heart-rending episode in the life of Nemi Kumar and Rajul has been sung by the Jain poets in a touching and thought provoking manner. It has also been the theme of many traditional paintings and crafts. It was indeed an unusual episode of separation for the Jain stories-separation without a physical contact. And what did Rajul get out of it except a pleasant reverie? Compared to her, Yasodhara enjoyed the company of the Buddha for some time. She had a son to support her, she had the expectation that the Buddha would some day come back. Sita too enjoyed the pleasant company of Rama and she had the expectation of a future restoration-though circumstances were very much against her, she knew for certain that Rama's mind had not changed. So hope still lurked. Even Radha was not fully disheartened. But Rajul got nothing before she was discarded, and she held nothing on which to live in memory. Besides, the mind of Nemi Kumar too had changed, and so there was no hope on which she could live on. There was the need of a Bhavbhuti (Bhavbhuti was a Sanskrit poet) to depict the pathetic story of this pious lady. Monk Neminath was already self-enlightened, and now he started making steady progress on the steps to stability. On the 56th day from his initiation, he rose to the stage of kshapaka-shreni, which was the extreme point in penance, and soon acquired the supreme knowledge and became a Bhagwan. He shone like a beacon light for full seven hundred years, showing the right path; and, in the end, on completion of the life-span of a thousand years, he entered into liberation at the Girnar mountain. This is the reason why Girnar has been considered to be a Siddhakshetra, a Land of Liberation. This is a holy place of the Jains. Located near Junagadh in Gujarat, this place attracts also many who are not Jains. This was not only a land of liberation for Neminath, this was also a land where he practised penance. Rajul too practiced her penance here. Two sons of Krishna, Pradyuman Kumar and Sambhu Kumar, too were liberated from their seat on this mountain. Pradyuman Kumar was a Kamdev.